F is for fragment; T is for testimonial. 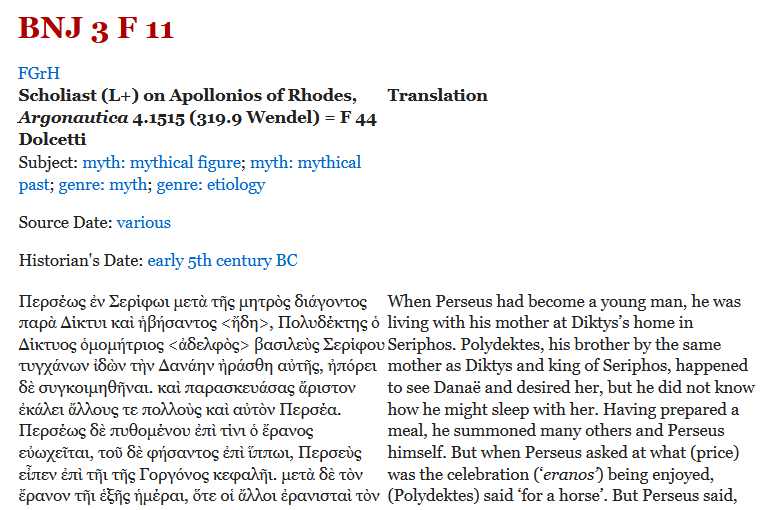 Once you find the section on a given author, the fragments appear before the testimonia. 11 is the number of the fragment being cited. These appear in numerical order in the print volumes, so 3F11 will follow 3F10 and precede 3F12. The origin of this post was a plea by IM from a librarian friend who was staffing the chat reference service at an academic library. 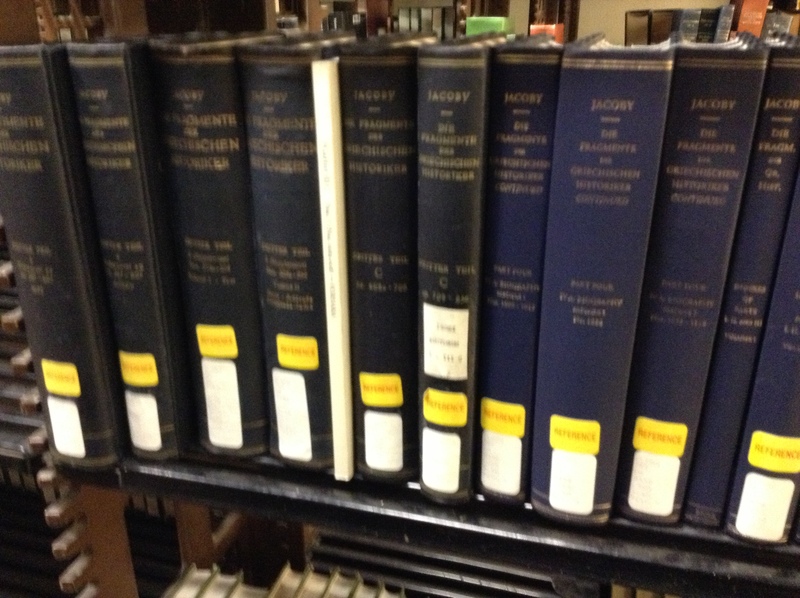 A student had the citation “3F11” and the knowledge that this referred to Jacoby’s Fragmente Der Greichischen Historiker (usually abbreviated FGrH, so the student had probably already done some work before turning to a librarian.) 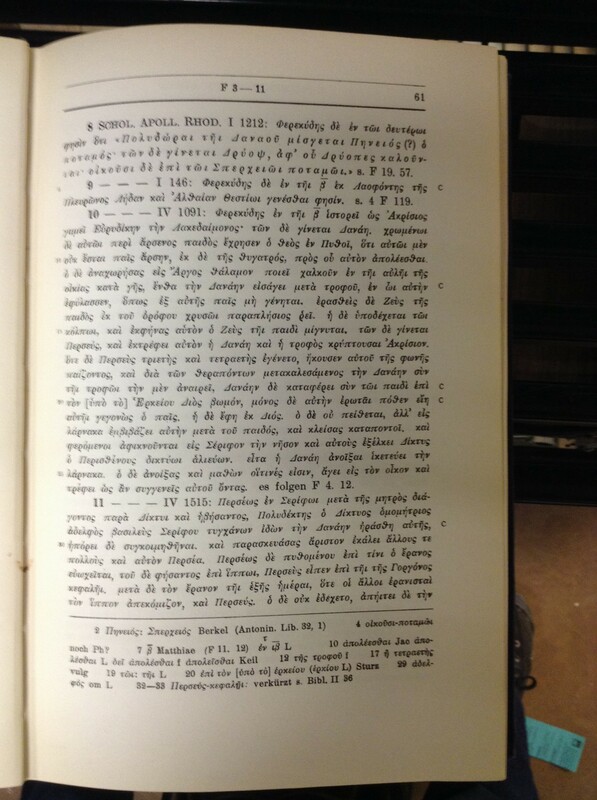 My friend was able to tell the student that their institution owned the print volumes (WorldCat), although they did not have access to the digital version available through Brill, and that it was a 15-volume set, but the student really wanted a volume and page number. Sorry for the blurriness of some of the iPad photos. I seem to have shaky hands. Here’s our fragment! 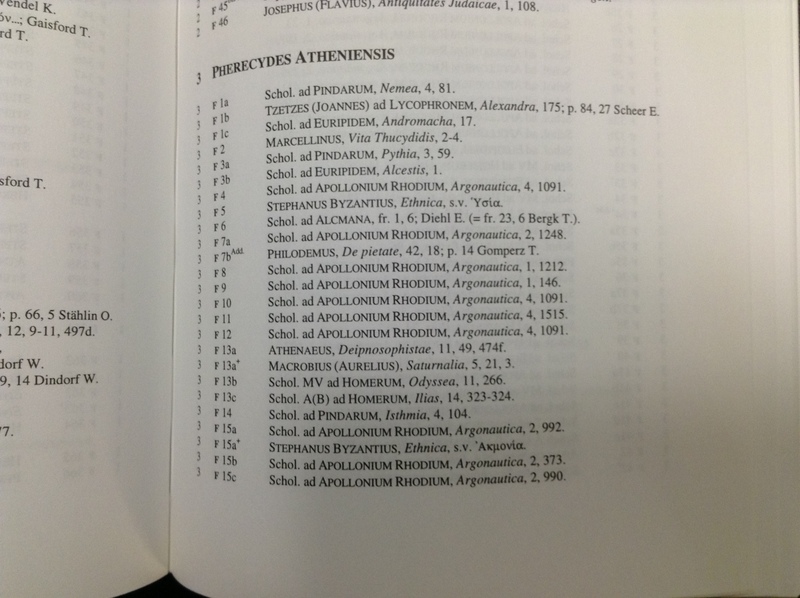 Now, if you did’t have a citation, but knew that you wanted a fragment of Glaukippos, or whoever, you’d turn to the Author Index in the original print set (vol. III part C pp. 947-64) and find out your author’s number, then find the correct volume for that author. 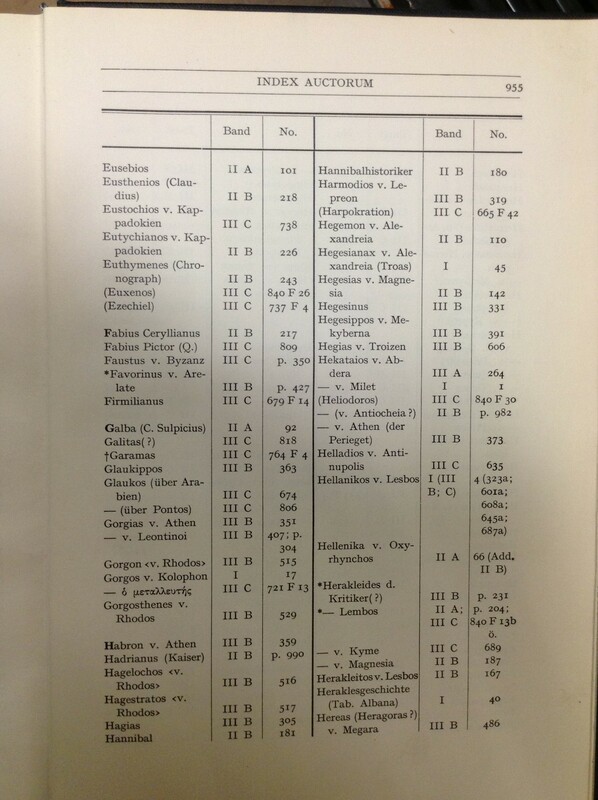 So looking at the page below, Glaukippos is author number 363 and is found in vol. III part B. My librarian friend’s institution doesn’t subscribe to the digital Brill’s New Jacoby (which is bundled with digital versions of the original Jacoby volumes in Jacoby Online, and which is not yet complete but estimated to be so in 2017) but I was at the University of Cincinnati Library and they do, so I checked it out. A search for 3F11 netted 5 results (and unfortunately our fragment was last on the result list for some reason). Last month an embarrassingly long time ago now that it’s November, I spent a day off work at the John Miller Burnam Classical Library at the University of Cincinnati, and among the errands I undertook was a look at their trial of the EBSCO interface to L’Annee Philologique. Following are my notes, keeping in mind I probably only spent an hour or two total with the database, and several things occurred to me afterwards that I did not have the ability to go back and check on. I welcome comments from others who have tested, or adopted, this interface for L’Annee. Overall they have done a surprisingly good job of translating the quirks of L’Annee into the standard EBSCO format (when I worked at UGA, we subscribed to a large number of EBSCO databases, so I have spent a lot of time with the blue-and-green logo ball). But for those of us pretty intimately familiar with both, the mashup is kind of weird and takes some getting used to! Some of these are rather strange or opaque, as my notes indicate. While being able to search all the indexed fields available in a database is nice, in this case the labels on the fields can be misleading or simply perplexing. There are some that seem so obscure they might better have been left out, in my opinion. Most entry-level searchers may do best to stick to TX, which does a keyword search of the record (equivalent to a “full text” search in the L’Annee native interface). One can also browse the two Subjects and Disciplines indexes, and these operate exactly as in the native interface, where one can expand the broad terms by clicking to reach deeper levels of the subject classification. L’Annee in its native interface abbreviates the titles of journals, which only expand when hovered over with the cursor. In the EBSCO interface journal titles are expanded by default, but abbreviations are also included, and can be searched interchangeably with the full titles. I tested a search for “aja” and found it returned the same results as a search for “american journal of archaeology.” Yay! The EBSCO interface is in English, of course, but subject headings that appear (i.e. in the sidebar to facet a search after it’s been made, and in individual records, see image below) appear in both French and English (duplicates), which I can see as confusing and/or off-putting to undergraduates who are wary of languages they don’t know. This seems a strange choice – why not simply include the English translations and leave out the French originals? 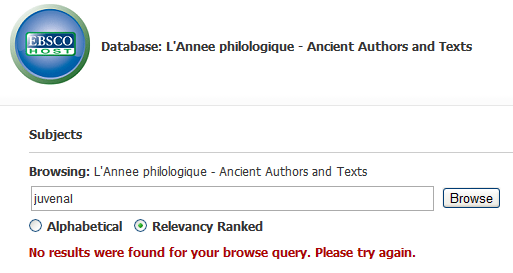 Another EBSCO feature included in this version of L’Annee is the suggestion of alternative search terms when a search returns few/no results, displaying “did you mean…”. I found this only appeared some of the time – perhaps the less common vocabulary of classics sometimes stumped EBSCO’s recommender – and when it did appear was sometimes useful and sometimes not. (This is not a problem unique to L’Annee – at one point I had a small collection of wildly irrelevant things databases would suggest to me I ‘might have meant’.) Overall, in assessing whether this feature added value or complicated matters, I might well have chosen to leave it off. A second question to consider is who uses L’Annee. In my anecdotal experience, faculty use it occasionally to rarely – they tend to conduct research by bibliographic chaining out from known items, and looking for new publications by scholars whose work they already know. Graduate students, especially PhD students, are probably the heaviest users, given their need to move from a position of little knowledge on a subject to mastery of it, often including a full historical literature review. Graduate students also have a minor tendency to become obsessed with bibliographic completeness (raise your hand if this is you.) In my experience, undergraduates are generally slow to be exposed to L’Annee, even those majoring in Classics at top-ranked institutions. They are unlikely to be using it at all unless a librarian or faculty member has both recommended it and taken the time to demonstrate its value. The EBSCO interface might make L’Annee an easier sell for undergraduates – since after all, you can plop “homer” into a keyword search box that looks pretty standard and get (some) results. Grad students and faculty are more likely to resist change, and in my opinion the EBSCO interface doesn’t add anything valuable enough to the native one to be a dealbreaker. A third question is, does your institution already subscribe to a large number of EBSCO databases, and is your library promoting a unified search of the local catalog and subscription databases (like GIL-Find/Multi-Search at UGA or Summon at Cincinnati)? If you’re already heavily EBSCO, you’ll likely get a better price, and your students will already feel pretty comfortable with the look and feel of EBSCO. More classics-themed results will be included in a catalog-and-database combined search. That might make switching worth it. Who else has had a trial of the EBSCO version of L’Annee? What was your evaluation, and what has your institution chosen to do? You are currently browsing the archives for the Databases category.